When I got pregnant, I suddenly went from the most optimistic, positive person on the planet to a total doomsday prepper when it came to my baby. Instantly everything weird or different or unusual happening in my body was something horrible. And it only got worse after Coura was born. If she was crying, something was wrong, if she was quiet, something was wrong. I had crazy dreams about dropping her, or leaving her somewhere, or forgetting to feed her. So in the real world, knowing that she was safe and taken care of no matter what, was extremely valuable. When I found out I was pregnant a year ago, I had just come out a 21-year marriage where I left my ex-husband. I had spent the previous six months shacking up with friends and family, training and racing, and doing some soul-searching to figure out what was next for me. What I didn’t focus on was making money. I made enough to get by, but I didn’t have anything saved, especially for what was coming next in my life, a baby. 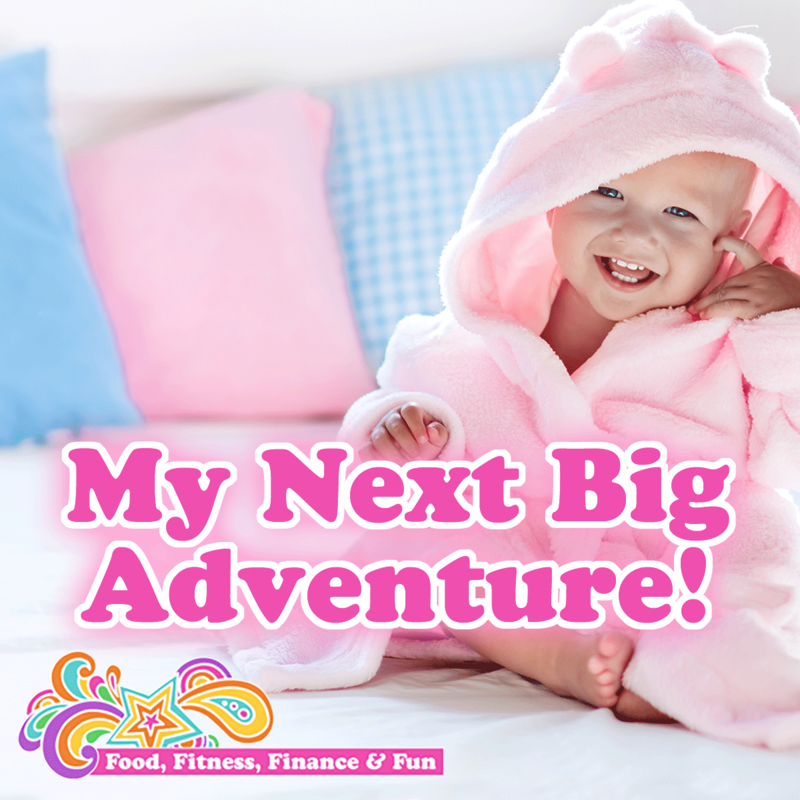 I wasn’t freaked out about having a baby when I found out I was pregnant, but I was a little concerned with the financial aspect. I knew if I had a completely simple, easy, normal birth, I could come up with the money to pay for it. But with all the testing, extra doctor visits, and potential issues that go along with having a “geriatric pregnancy” (yes, that is what it was called since I was 45 years old), I wasn’t sure how much more that would all cost. I had never needed any financial assistance, so I didn’t know how it would all work or if I would even qualify, but a couple people suggested that I look into Medicaid. I did some research, filled out all the paperwork, and was accepted. What a godsend this program was for me. It gave me so much peace of mind when it came to prenatal care, labor and delivery, and postnatal care for me and my baby. I didn’t have to decide which appointments were most important and which I could skip. I didn’t have to decide which tests I could afford and which I couldn’t. And I didn’t have to ask when given the options during my delivery how much things cost such as an epidural, the Bili light, and the supplies I use during my five-day stay in the hospital. I also didn’t have to worry about finding the cheapest pediatrician or deciding which appointments where most importance when Coura was born. Because she was not gaining weight for the first two weeks after her birth, we had to go to her pediatrician every two days until she did. I’m so grateful I didn’t have to worry about how I was going to pay for all this help. Plus, being a stressed-out mom to be, or a worried mother, doesn’t help a struggling baby at all. At first, I was super embarrassed being on Medicaid. Whenever I was asked who my insurance was, I hated hearing the word come out of my mouth. I thought for sure people would judge me or think I was irresponsible or that I wasn’t fit to be a mother. But now I am just grateful. Grateful I got the best care for me and my baby. Grateful I didn’t have the added stress to pass onto Coura before and after she was born. Grateful I can focus on spending time with her and taking care of her needs now instead of working over-time to pay off thousands of dollars in medical bills. I am just grateful. This has also taught me not to judge others so quickly! Like I said earlier, I would have totally judged me before this! I thought people who needed financial assistance were lazy or irresponsible, or worse! I never considered they may just be going through a life change or transition or a tragedy or whatever!! Most of us just need a little temporary help to get back on track when we’ve been side-swiped! Luckily mine was a little bundle of blessing and even luckilier (did I make up that word?) that there is a program out there to support me in supporting her! Thank you Medicaid! I don’t know what I have done without you! And thank you peeps for loving me unconditionally! Welcome Coura McCay Sutphin to this MIRACULOUS World! I may have gone a little crazy on social media the past 2 weeks on posting pics of my new baby girl, but I am not apologizing. I do the same thing every time I have been proud of an accomplishment, enthusiastic about a new adventure, or pretty much anything I am excited about in my life, which is usually a lot. A couple hours after I posted my weekly “Happy Bump Day” preggo photos for #36weeks, I went to the hospital to check on a “dribble” which ended up being my water breaking. About 38 hours later, I popped out an amazingly perfect baby girl. In fact, she didn’t even have to visit the NICU! Most “preemies” do, but she is an over achiever and passed most of her initial tests with flying colors! 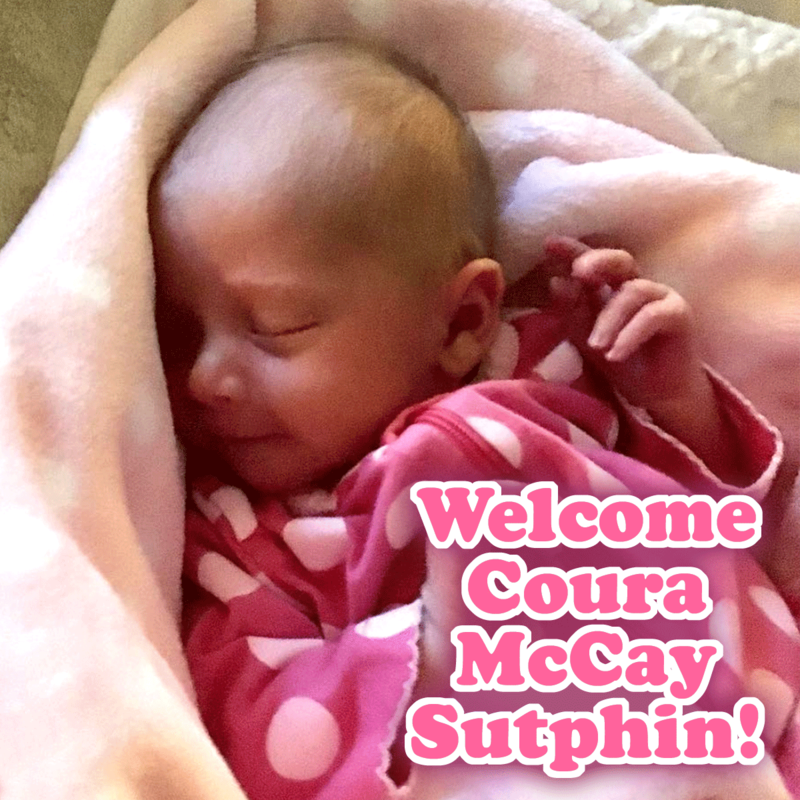 Check out Coura’s birth story! – Our Birth Plan: Have a F-ing Baby! She did have to sleep under the bili light for 2 days, but that’s common in all babies, not just preemies. Coura McCay Sutphin was born at 7:28 am on June 15, 2018. She was 18.5 inches long and weighed 5 pounds 13 ounces. She is a Gemini and a 5 in Numerology. I know ALL moms think their baby is beautiful and perfect and such, so I’ll spare you the doting, but the second she came out of my body and lay straight over my heart, I knew how much I would adore her for the rest of my life. As most of you know, Coura was not planned, and in fact was a bit of a miracle. But from the moment I found out I was pregnant, I was looking forward to the day I got to meet her. I look forward to seeing her experience life and explore this world with and without me. I am excited to see how she responds and reacts to every part of her life, and I can’t wait to see how we both grow and benefit from knowing each other. Coura is short for Courage. Courage is one of the main themes in my life. I am not always brave, but I always strive to be. It’s not easy taking action when I have no idea the outcome, but if I’m not brave enough to try, I will never create my ideal life. I am scared all the time, but I remind myself that courage gives me hope and hope is the only emotion stronger than fear. So I stay hopeful and courageous. And now I have this precious piece of me to remind me that courage trumps fear every damn day for the rest of my life! Thanks for sharing this amazing experience with me! I tend to set big goals and work towards accomplishing giant feats. And since I have gotten in the habit of announcing all my goals and dreams and plans to the world, when I get done with one thing, people always ask me what’s next! I usually have a plan and a plan after that plan! But last year after my 2 year goal of qualifying for and racing the ironman world championships in Kona, Hawaii, I didn’t have a plan. I didn’t make many plans or set many goals throughout the year. I took one day at a time, one moment at a time, and learned to live in the moment and be grateful for where I was right then and there. It felt uncomfortable at first, but over time, I truly began to be open to what was next for me. I took advantage of every opportunity that was presented to me, even if I had no idea where it would go or what it would do for my future. And by the end of the year, when people would ask me what was next, I could say with 100 percent certainty that I was open to whatever was next for me. I would take on whatever was presented to me, and make the very best of it, knowing that that was where I was supposed to be in my life. So although I was very VERY surprised, I was not scared, when I found out six weeks ago that I was going to have a baby. I stated over and over again that I was open to what was next for me in my life, and this is what the universe gave to me. As a 45-year-old, who was not trying to get pregnant, who had been on birth control the majority of my adult life, and rarely had a period to begin with, the chances of me getting pregnant were less than one percent. So I know this baby really really REALLY wanted me to be her mother. So that’s it! That’s my new adventure for 2018. I feel excited for this new chapter of my life, and I know without a doubt this is where I am supposed to be right now and this is what I am meant to be doing. P. S. It’s a girl!